loving the long cardigan! awesome look! 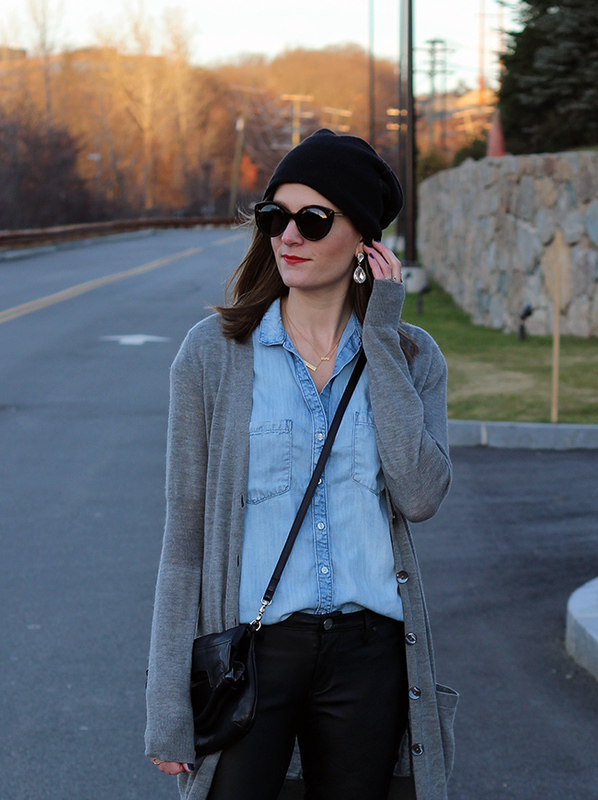 I love how you mixed together chambray and leather leggings. It totally works and the red shoes are the perfect finishing touch. Happy New Year! I love your shoes. They are so gorgeous. LOVE this outfit! The mixing of textures is just perfect! Hope you enjoy your low-key New Years! wishing you a wonderful 2016! Love the leather pants! I have a coated pair, and I feel like they are so fun. Great with your chambray! Your NYE sounds like so much fun! I'm so glad you get to see your family. i like the red flats! Thats a beautiful outfit, love the red shoes! These leather pants are amazing. The fit of them is right on! I love the red lace up flats too. Happy New Year Rachael! Those shoes are beautiful!! I hope you have a Happy new Year! I love these leather pants on you and paired with the chambray top and red flats is the perfect combination! This is so beautifully styled! I love how relaxed everything looks, yet super chic! My own personal favorite outfit looks very much like this! Love it! Definitely going to copy this look! It includes so many of my favorite pieces! This outfit is so Rachel and I mean that as a compliment. I love when I see outfits that totally identify a blogger. You are wearing neutrals which you love and great basics with a pop of red. You know I looooooove those shoes. Your chambray, pants and bag are my favorite too besides the shoes. Looking great.